When you need an easily concealed defense weapon, this Karambit knife is exactly what you are looking for. 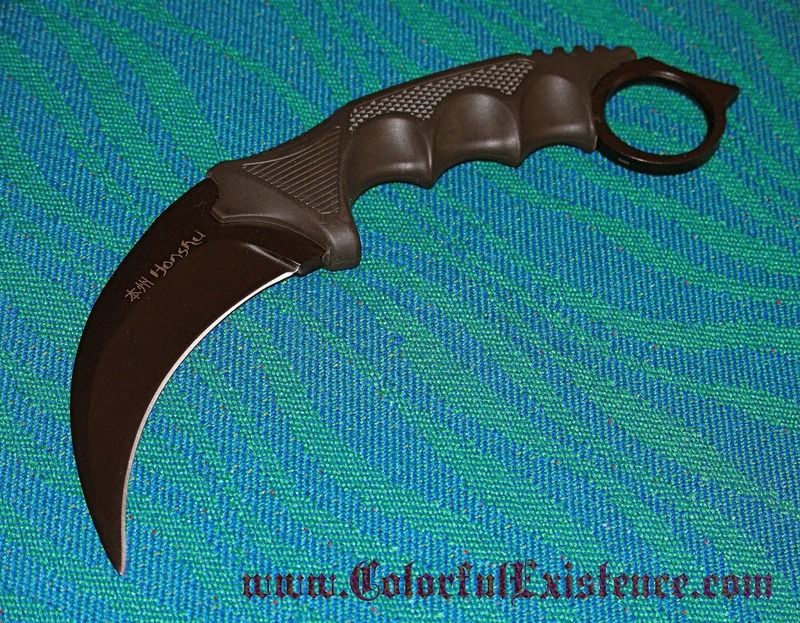 This aggressive Karambit features brilliant tactical details in its design. It’s full tang construction is built with solid AUS-6 Stainless Steel claw blade finished in black to reduce glare, has a secure rubberized handle with an open hole for an easy grip, ending with a “skull crusher” ring spike-tipped pommel . Weighing in at 5.6 oz, the blade itself is 4″ long while the overall length of the entire claw measures at 8.75″. 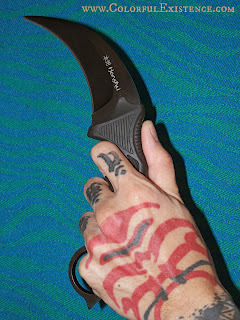 The weapon is held by inserting the first finger into the hole at the top of the handle, so that the blade curves forward from the bottom of the fist. Next, close the fingers tight around the handle, locking the handle into the hand. Then, close the index finger around the finger ring. And finally, the thumb is closed tightly against the fingers in a typical clenched fist fashion. 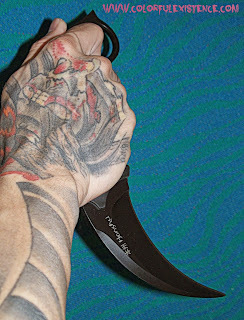 While it is primarily used in a slashing or hooking motion, karambit with finger rings are also used in a punching motion (knuckle duster) hitting the opponent with the finger ring, as well as designed to be used in a hammering motion (glass breaker). There’s simply too many different ways to wield a Karambit, all of which are very effective. This flexibility of striking methods is what makes it so useful in self-defense situations. The finger guard also makes it difficult to disarm and allows the knife to be maneuvered in the fingers without losing one’s grip. This is cool. I need a new knife too…=) Hopefully they’re legal in the US haha. Are you getting a “Tiger Claw” for yourself?